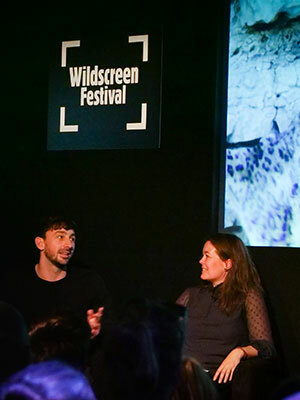 Panasonic was proud to sponsor an exclusive seminar with three leading individuals in natural history production at the Wildscreen Festival held in Bristol from the 14th-19th October 2018. The event was well attended by camera operators, aspiring filmmakers, directors and producers, who all gathered to listen to the speakers’ experiences of using the VariCam and EVA cameras in extreme environments. The workshop was hosted by Elizabeth White, Producer/Director for Islands, the opening series of Planet Earth II, and also the Frozen Planet series for the BBC NHU. After a brief introduction, the three filmmakers premiered a clip of their footage which was shot with the VariCam LT, VariCam 35 and the EVA1. They discussed their experiences of capturing wildlife behavioural sequences on the Panasonic cameras, concluded with an audience question and answer session. Hector Skevington-Postles –Recently captured snow leopards in the Himalayas for the BBC NHU ‘Big Cats’ and has been involved on shoots for the upcoming ‘Our Planet’, all of which were shot on VariCam LT.
Martin Dohrn – Producer and director for ‘David Attenborough’s Ant Mountain’, and the upcoming ‘Age of Big Cats’ for Ammonite, both of which were shot on VariCam 35. David Diley – A multi-award winning filmmaker and underwater cinematographer, known mainly for his work with large sharks and other marine predators. He uses the EVA1 in a Nauticam underwater housing unit. The first speaker was award winning director and producer Martin Dohrn. Martin’s career spans over 20 years producing landmark natural history series’, and has previously worked with National Geographic, the BBC and Terra Mater among others. His latest projects, for which he used the VariCam 35, involved working with Sir David Attenborough on ‘Ant Mountain’, and ‘Age of Big Cats’, looking at seven species of big cats and their ancient ancestors from the early ice ages over two million years ago. Attenborough’s Ant Mountain was shot on the Swiss Jura at about 1000-2000 metres altitude, presenting a number of challenging conditions. “An extreme environment is simply an environment for which you are not ready. We went there in the winter with lots of warm clothes, heavy boots, lots of equipment and were ready for the ice and snow, yet the sun came out and melted all the ice and snow. There were days when we weren’t ready for that and the ants weren’t ready,” says Martin. The VariCam’s flexibility helped Martin to capture incredible footage in the tough environment. The area in which Age of Big Cats was filmed had variable light conditions, and often involved shooting at night and dealing with torrential downpours. Hector Skevington-Postles is a wildlife and documentary cameraman. His extraordinary project, Big Cats, involved chasing snow leopards across the Himalayas in Northern India. Hector chose the VariCam LT for his shoot, spending five weeks navigating the terrain. “Spiti Valley was the location of our shoot, and is a hotspot for snow leopards,” says Hector. “There were about eight leopards in this vast environment. In the Himalayas there is a Halo Effect, where there’s a high abundance of wildlife in areas where Buddhism is strong. As a result, you get a real culture of looking after the animals,” Hector explains. The extended battery life on the VariCam LT also proved crucial to Hector during the course of his filming expedition. “The LT actually draws relatively low power, so you get more out of the batteries. It’s those small things that over a long shoot will make a big difference. David Diley on EVA 1Finally, David Diley is a filmmaker specialising in underwater cinematography, and shooting marine life. His experience with the Panasonic EVA1 involved taking it to Egypt to shoot Oceanic White Tip Sharks. He outlined his experience using the EVA1 and the extreme environment he faced whilst diving in the Red Sea.